How are old and new freeway lanes joined? With Jamzilla approaching this weekend on the 405 freeway, I thought this would be a good time to re-run a post from the I-405 Sepulveda Pass Improvement Project’s web page. The aim of the work this weekend is to pave a major segment of the new northbound HOV lane in the Sepulveda Pass. The work is considered key to meeting the project’s scheduled completion date of 2014. Although it appears to be a flat gray ribbon uncurling toward the horizon, a freeway lane has tiny peaks and valleys, slopes and divots created by hundreds of thousands of automobiles and their tires or—in the case of the I-405 through the Sepulveda Pass—tens of millions of cars. As workers add a new lane, as will happen along 10 miles of the I-405, matching the contour of the new lane with the veteran lane takes some finesse. If the existing lane and new lane are not well married, the pavement will be subjected to high stress levels from the traffic that it serves. Tires will find ridges between the slabs, creating an uneven and rough surface that is sure to take a toll on your vehicle’s performance. The roadway for the I-405 Sepulveda Pass Project has three layers. First is an aggregate base (AB) composed of crushed rocks in varying sizes from 3/4 inch to dust. Following that is lean concrete base (LCB) which provides a stable, ridged, and low eroding platform for the concrete slabs. LCB is a mixture of AB with a small amount of concrete to bind the aggregate tighter. Although drivers roll over the jointed plain concrete pavement, that is only the top of three layers composing the I-405 roadway. This graphic shows how a new piece of freeway is held to existing pieces. The final layer, which you are most familiar with, is composed of ridged pavement known as jointed plain concrete pavement (JPCP). JPCP is the common standard for California freeways as it is engineered to include longitudinal and transvers joints. These joints are created by using a saw cutter to create cracks at specific intervals in the concrete. 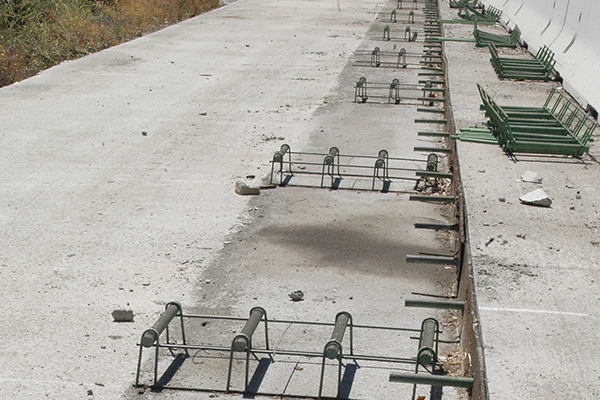 “To ensure that lanes are properly aligned, dowels are used to relieve the stress between concrete slabs,” Caltrans engineer Steven Zaw explains. These dowel bars are made of smooth epoxy coated steel and bonded into existing concrete sections to act as a guide when the new concrete is added. When the new concrete is poured, dowel bars are placed into the new concrete as well. Dowels have already been drilled and bonded into the existing concrete section. The dowel baskets are being placed in preparation for the concrete mixture to be poured. This new section, north of the I-10, now serves as the sixth lane of the northbound I-405. As the concrete is smoothed and begins to settle, a tinning machine will be pulled though the new concrete slab to create textured grooves into the concrete surfaces. These textured finishes are essential in preventing vehicles from hydroplaning during rain or increased moisture on the freeway. These textures also reduce tire noise from the concrete. After the tinning machine finishes its work, a curing compound will be sprayed over the recently poured pavement. The new section will be left to cure for 10 days. This is the time needed for the concrete to solidify around the dowels and become drivable. It will take many more days for the concrete to completely cure. After its resting period, the recently poured slab will be tested to meet several statewide roadway standards. For example, each concrete slab must withstand 650 pounds of force per square inch without cracking. Another test will measure the surface, ensuring that the lines produced from the tinning are straight line with no more than 0.24 inch deviance. How does the saw cutting transverse joints in the ribbon of concrete not slice through the metal dowels? It is simply amazing that this technique works so well. California has thousands of miles of roadways built in this method that are just perfect 60 or 70 years after completion. Parts of PCH in Malibu have concrete sections built in 1947 that are smooth as silk. Ability to handle heavier truck loading and volumes.